This post is a response to the Weekly Photo Challenge: Letters. Click here to read more entries. For another post that is not new but meets the same challenge, see Weekly Photo Challenge: The Sign Says. This post originally appeared on The Advocates Post. Human rights advocacy takes many forms, and human rights activists can be found in every corner of the world. Tremendous advancements in technology and communication have allowed activists to form strong international networks and to share emerging information about human rights abuses almost as soon as they happen. These advancements have fundamentally changed the way human rights organizations work, including how they engage in human rights advocacy with broader communities beyond a country’s borders. Yet the unique role diaspora communities can play in improving human rights around the world has largely been overlooked in the human rights field. It’s time for that to change. Members of diaspora communities play an increasingly important global role and can be a bridge between individuals, governments, and international legal and political mechanisms. Diaspora communities are a critical link in changing social institutions and structures to hold governments accountable. Many migrants – refugees and asylum seekers in particular – leave their homes because of human rights abuses. Many were political and human rights activists in their home countries and they bring their experiences with them. In some countries with repressive governments, security concerns mean that diasporans must take the lead in speaking out. From their new home base, they can bring change in their countries of origin. For more than 30 years, The Advocates for Human Rights has witnessed the powerful role that diaspora civil society organizations play in documenting human rights abuses, influencing policy, and advocating on behalf of victims of human rights violations in their countries of origin. As a legal service provider, The Advocates is often the first connection that asylum seekers have to their new community in the United States. Because of this special relationship, diasporans from dozens of countries have requested assistance from The Advocates in documenting human rights violations “back home.” With diaspora communities, The Advocates has conducted groundbreaking work, such as the Liberian Truth and Reconciliation Commission Diaspora Project, ensuring that public hearing testimony and the statements of 1,200 Liberians living outside of Liberia were included in the formal history of the conflict. The report, Human Rights in Ethiopia: Through the Eyes of the Oromo Diaspora, proved the significance of involving individuals who have left a country in work to hold governments accountable and affect human rights in their home countries. The Advocates has also collaborated with the Indian American Muslim Council on advocacy on issues concerning religious minorities at the both the U.S. Congress and the United Nations, demonstrating that diaspora voices can have an impact on human rights in India. The Advocates recently completed a two-year project to identify needs and create tools to help tap the underexplored resources of diaspora involvement in human rights. The result is a groundbreaking resource called Paving Pathways for Justice & Accountability: Human Rights Tools for Diaspora Communities. This manual, available for download at no cost, provides a full menu strategies and resources designed to empower diaspora communities to be more effective advocates for human rights in their countries of origin. build their capacity to improve human rights conditions. While the tools and resources presented in this manual were specifically created for use by diaspora communities, this manual can also benefit and be used by human rights defenders and civil society organizations throughout the world. The international community needs to do more to recognize the unique contributions that diaspora communities can make to building respect for human rights around the world. Rather than treating diasporans solely as economic sources of remittances, investment, and philanthropy, countries of origin and countries of residence should facilitate engagement in long-term social change. With this new resource, The Advocates is taking an important step in supporting diaspora communities in their efforts to improve human rights around the world. Individual chapters can also be downloaded for free. Use our Quick Reference Guide! International Organization for Migration and Migration Policy Institute, Developing a Roadmap for Engaging Diasporas in Development (Washington DC and Geneva: IOM and MPI, 2012), 15. Also available online at http://www.migrationpolicy.org/pubs/thediasporahandbook.pdf. 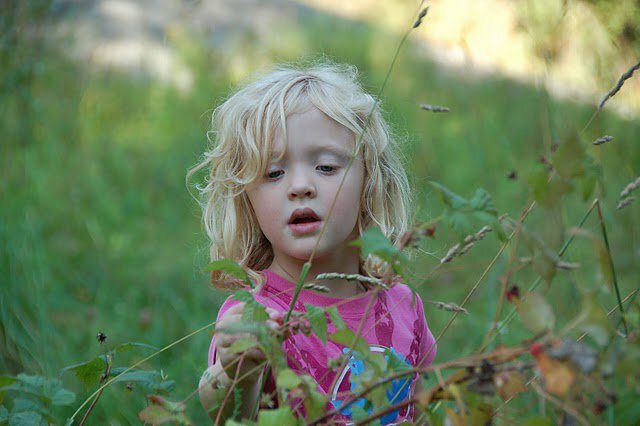 My daughter in Norway in August 2010. For many in Norway, the terrorist attacks on July 22, 2011 represent the loss of innocence. On the morning of July 22 last year, I read the breaking news of a car bomb attack in Oslo, Norway. I clicked on the link to the NRK live coverage, forgetting that my three children rise and swarm, like mosquitoes from tall grass at dusk, at the slightest potentiality of a video. “WHAT IS HAPPENING?” yelled my then-9-year-old son. Gasps all around. We had been in downtown Oslo less than a year before. We had been in that part of town and I think we may even have walked down the street where the explosion damaged several government buildings. “WAS ANYONE WE KNOW HURT?” screamed my then 6-year old daughter. I was trying to remain calm; I was struggling with a decision. As a parent, you have to make a choice about what horrific events you introduce to your children. And you have to decide – often on the spot – how to talk to them about tragedy and violence. You have to find the words to explain the evil that exists in the world while you simultaneously reassure them that, for the most part, they are safe. Obviously, this is not easy and there is no manual. But it is part of your job as a parent to help them make sense of life as a human on this planet. “IT’S LIKE NORWAY’S 9/11!” blurted out my then-nearly-12-year-old son. Presciently, in hindsight. It was that statement that decided me, that hardened my resolve. You see, like everyone else, I have a story to tell about 9/11. That’s a story for another day, but, suffice it to say, it committed me to engaging my children in a year-long discussion about the tragic events of July 22, 2011. The Norwegian media were cautiously talking about how preliminary evidence indicated a terrorist attack. So we had a fruitful discussion (or at least what passes for a “fruitful discussion” when your kids are 6, 9 and 11) about 9/11 and the impact of those events on America. My children do not remember our country before 9/11. It was good to talk to them about the need for security, as well as the need to balance security with the protection of individual rights, including discrimination based on race and religion. They were engaged. They asked questions. Then, with the request to be kept informed of the emerging news of the Oslo bombing, they went on their way to do whatever it is that 6, 9 and 11 year old boys and girls do on a bright summer day. But as the day went on, the news from Norway got dramatically worse. 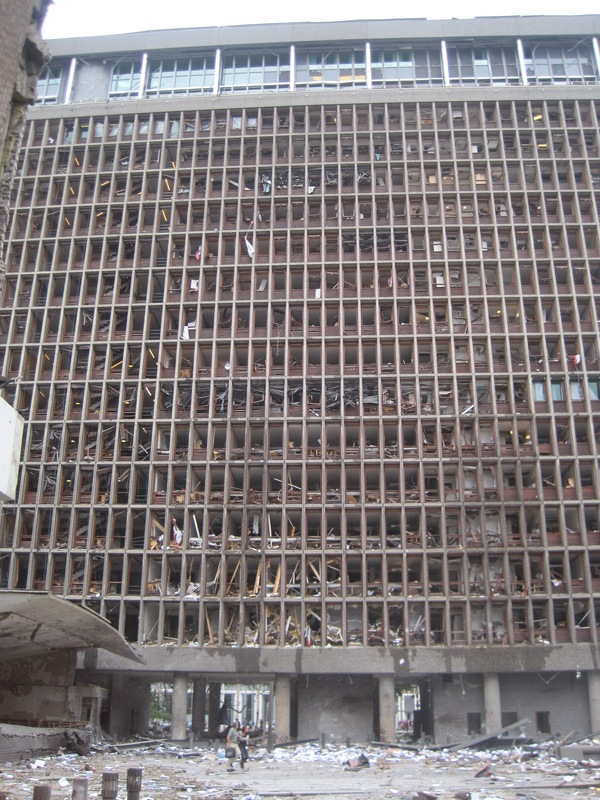 Eight people were killed and nearly two-thirds of the 300+ people in the government buildings were injured (and had it not been 3:30 pm on a Friday in the holiday month of July, there would certainly have been many more casualties). But the car bomb in Oslo was merely a distraction. Less than two hours later, right-wing extremist Anders Behring Brevik, dressed as a police officer in a fake uniform that he bought on the Internet, took the ferry to the island of Utøya in nearby Buskerud. There he killed 69 people – mostly under the age of 18 – at an summer camp for politically active young people in the AUF (Arbeidernes Ungdomsfylking), which is affiliated with Norway’s Arbeiderparti (Labor Party). 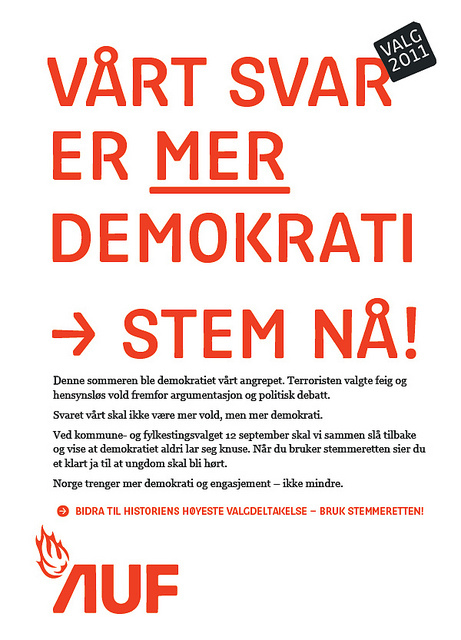 AUF describes itself as “Norway’s largest political party youth organization and champion for a more just world (“AUF er Norges største partipolitiske ungdomsorganisasjon og kjemper for en mer rettferdig verden”). Anders Behring Breivik carried out the massacre in cold blood, coming back to shoot again those who were lying injured, shooting kids in the water as they tried to swim to safety. He later claimed that he was trying to save Norway from Muslims world by attacking Social Democrats, Norwegian immigration policies and the concept of multi-culturalism. This photo of participants at the AUF summer camp on Utøya was taken July 21, 2011, the day before the massacre. I said something about hatred, but there was really nothing I could say by way of explanation. Far too many lost their lives on July 22, 2011. And Anders Behring Breivik’s hateful, violent acts stole not just the future of scores of young people, but also the innocence of a peaceful nation. Just as we demarcate contemporary US history as pre- and post-9/11, so for Norway is tjueandre juli (22 July). Luckily for me as a parent, stories began quickly emerging about what happened on Utøya. Amazing stories of luck and bravery. Young people not much older than my own children who showed great presence of mind in an unthinkable situation. Leadership and sacrifice. These are stories – and there are many – that deserve more space than I have to give here. But we followed these stories in the days and months following 22 July. They gave us hope. They showed us that ordinary people – most of them still kids – could do extraordinary things. There is much in our interactions with the world that we cannot control. We can control, however, how we act; how we REact to events and actions by others. This is a lesson I strive to teach my children. I don’t always provide a good role model, but Norwegian Prime Minister Jens Stoltenberg certainly did. I’ve been reading the speeches of Jens Stoltenberg this summer. From the beginning, he encouraged Norwegians not to give way to fear and hate and prejudice. He urged Norwegians to react to the attacks of 22 July by being MORE welcoming to the outsider, to the foreigner. Invite him in for cake and coffee, the Prime Minister suggested. Invite her to take a walk. Get to know one another. I’ve heard people say that Norway’s response to July 22 was simplistic. Idealistic. Naive. Maybe it wouldn’t work in other countries. But if you doubt that words matter, let me tell you what happened after the trial of Anders Behring Breivik began on April 16, 2012. Breivik had testified that a particular song, Barn av regnbuen (Children of the Rainbow) by well-loved Norwegian folk singer Lillebjørn Nilsen, with its concept of living together in a multicultural Norway, was brainwashing children into supporting immigrants. This is a song that Mr. Breivik, apparently, detests. So, shortly thereafter, in a chilly spring rain in a square near the courthouse in Oslo, a crowd of more than 40,000 people joined Mr. Nilsen in singing Barn av regnbuen. Many more were singing the song at the same time in smaller communities around the country. Norwegians throughout the country sang it as a form of protest against hatred. They sang it so loud that it could be heard in the courtroom. Once again, I clicked on a link to a video from Oslo. Together, my children and I watched this video. hver søster og hver bror. One night last week, I heard my now-10-year-old son singing in his bed. He was singing Barna av regnbuen. He sang the whole song, the refrain and every last verse. And then he sang it again. There will be many tributes on July 22, 2012. Remembrances and roses to honor the innocents who lost their lives one year ago, the survivors who will never be the same again. Add to them this tribute, from a kid in a bunkbed half a world away. A kid who, hopefully, has learned something from the tragedy of 22 July.